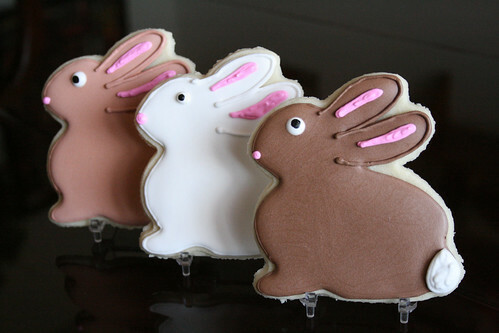 Well, I’m going to call this a win, and not one of my usual “Never-On-Time Series.” Yeah, I’m late in posting these Easter goodies from last year, but they are perfectly on schedule for THIS year. Go me! 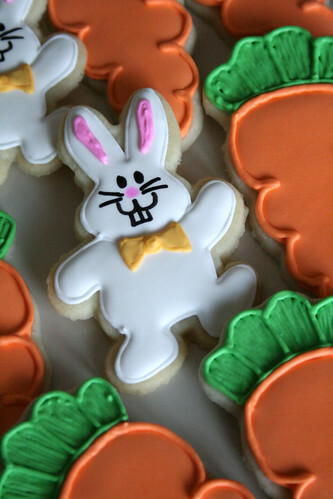 Our friends, Matt & Amber, hosted a big Easter party last year, and we were able to attend for a few hours. (Philip had to leave early to go to work, and A.J. is “way too big” for Easter egg hunts anymore. *sniffle*) I can’t remember exactly what Amber asked me to bring, but I’m sure it was something sweet, and that’s how I ended up with a big ol’ platter of Easter-themed cookies. 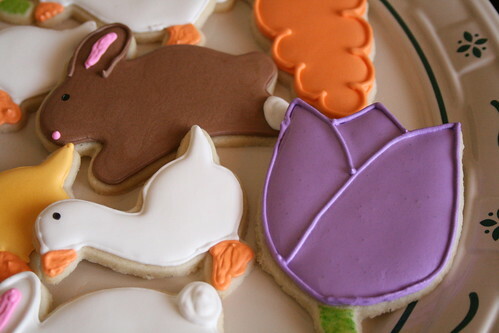 I had been saving the how-to for the Easter Bunny Bread for years from an old Quick Cooking, and I was delighted to finally have a big party to bring it for sharing! 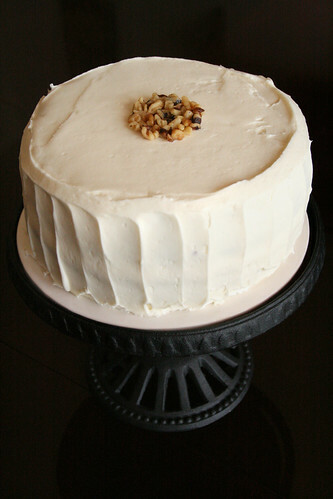 I could walk you through the recipe, but it’s really SO EASY, and you can find it right here on Taste of Home’s own website. I promise it’s not difficult in the slightest! He smelled so fantastically yummy, I really just wanted to eat him all up right then! I didn’t have a big enough tray for displaying him, so I just had to fill up that same half-sheet baking tray with all the lettuce & veggies for dipping, but I think it turned out well enough. I filled his tummy with a simple, yummy spinach dip, and he was ready to hop! 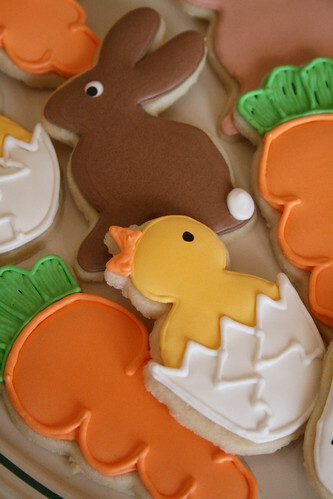 But back to the cookies for a little bit. I made a handful of different designs, all fairly easy. And a few hatching chicks as well. 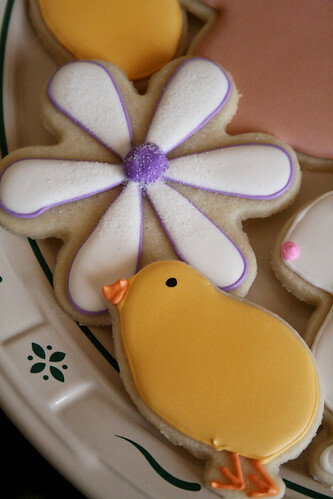 But I did spend a little bit more time on one sweet “Happy Easter” cookie. I think it might be my favorite from the platter, too. I hope you each have a blessed & hope-filled Easter! Be sure to have just a bit of chocolate, too. After all, there’s a bit of a “holiday drought” after this for a while! « Pretty Pansies: Let’s Smell the Flowers! Thank you, Susan! 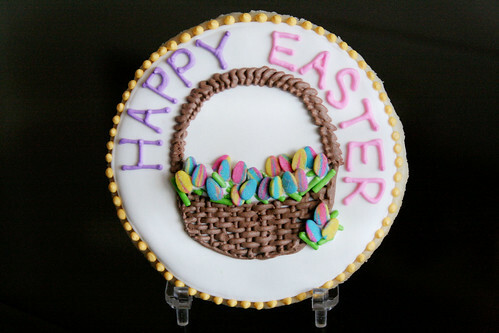 I want to do more basket weave cookies sometime, but I was pretty happy with how this one did turn out for my first go. 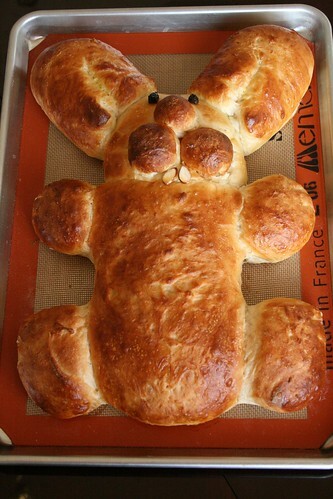 And I love-love-love the Easter Bunny bread. It’s definitely a recipe I plan to make each year as a new tradition! You are so creative and talented. I always look forward to getting your e-mails so I can see what you’ve been up to. Everything is so cute. Thank you, Kathy! That was so sweet of you to say. 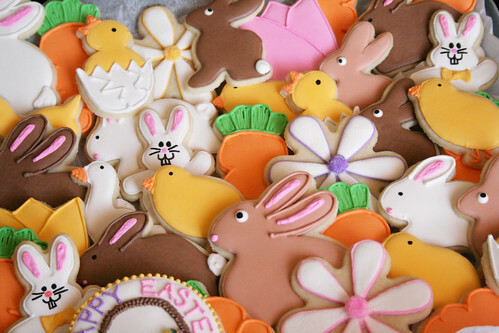 I love all your Easter cookies but the Happy Easter Basket one is my favourite…so pretty. 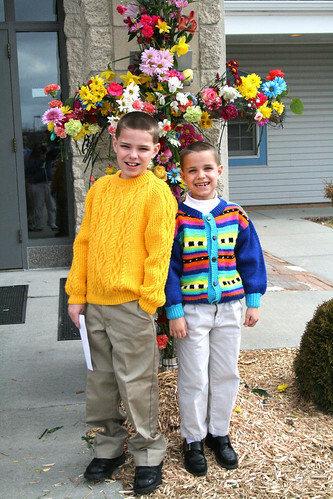 The boys looked adorable in their hand-knit sweaters (love the floral display behind them too). 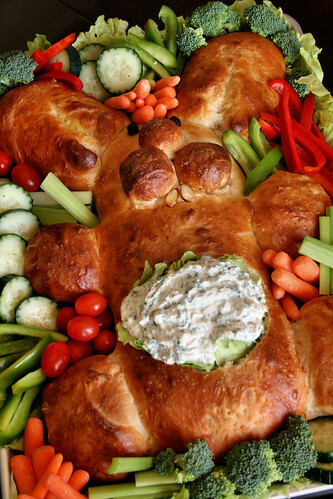 That Easter Bread is the cutest and what a great appetizer idea to serve at a party. 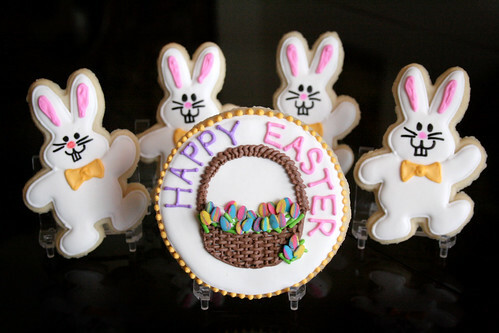 Happy Easter Nicole to you and your beautiful family. Thank you, Paula! The basket turned out pretty well for my first attempt last year at a weave pattern. I want to do more soon. My Aunt Edith is so very special to me, and she always remembers my boys in the sweetest ways. Those sweaters were AMAZING, even though she downplays her knitting talent so often. I adored Jack’s multicolor one so much, and it was his “favorite shirt.” He wore it all the time for about 3 years (it was too large when we first received it), and I was so sad when he finally outgrew it. Both sweaters are tucked away in a special place for the boys to have for their own children. what an amazing collection of wonderful things! Happy Easter! TASTE OF HOME?!!?! Kidding…That bread almost made me forget the cookies!!!!!! I love it!!! I know, I know! I almost didn’t say, but at the same time, the bread is sooooo cute! 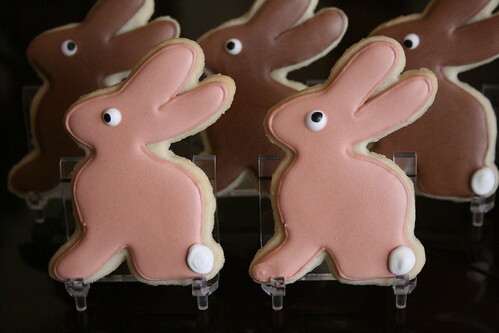 What fantastic collection of cookies, I’m loving your MR. BUNNY. what a cute idea! Thank you, Hani! I’m glad you like ‘em.